Yoga has become one of the most spoken and commonly heard word in the recent times. The word ‘yoga’ is derived from the Sanskrit word, which means ‘to join’ and can be understood as meaning ‘Unity’ or ‘Oneness’. Yoga is not, as many would believe, an ancient art that has mythological heritage, nor it is, as the popular belief goes, only about ‘Asanas’ and ‘Pranayamas’. Yoga, in its true essence, is the science of living in the right manner. It ensures ‘the right living’ during all stages of life viz. ‘Infancy’, ‘Childhood’, ‘Adolescence’, ‘Adulthood’, ‘Middle age’, and even ‘Ripe Old Age’. It encompasses all aspects of the personality – ‘Physical’, ‘Mental’, ‘Vital’, ‘Emotional’, ‘Psychic’ and ‘Spiritual’. This is achieved through various forms of yoga. Yoga creates an environment of dynamic peacefulness and harmony within. On a physical level, in strengthens and tones various parts of the body and improves flexibility, stamina and mobility. Biologically it does a balancing act on different systems of the body, helps increase vitality, strengthens immunity, detoxifies the body and improves all biological process and brain functioning. Mentally, it increases sensory awareness, improves concentration level, clears the thought process and relaxes the mind, focuses attention and frees the spirit. And most importantly, it keeps away negativity on all three levels. Yama – moral duties such as Ahimsa(non-voilence), Satya (Truth), Brahmacharya (celibacy), Aparigarha (self-restrain). Self-actualisations or identification with the pure consciousness is the pinnacle of achievement and ultimate aim of being yogi (one who observes and practices all aspects of yoga in daily life). What makes yoga so powerful a medium is the fact that it takes the holistic route of unification and harmony. Yoga provides individuals with their own way to connecting with their true selves. Such is the flexibility and adaptability of yoga that it transcend all barriers of place, religion, faith, caste, and creed and establishes connection with everyone who wants to embrace it for well-being. The science of yoga can be safely and effectively applied during all stages of life for enlightened and problem-free living and pregnancy is no exception to this. Yoga, if practised regularly under restrain and guidance, is known to have an immensely positive impact during all phases of pregnancy. The process of pregnancy will never be the same again if yogic techniques are applied and praised correctly. The entire experiences of pregnancy will then be as pleasant as the outcome itself. The most significant advantage of making yoga a daily ingredient of one’s life during pregnancy is that if followed correctly there are only positive effects that are seen. Unlike any other mode of modern treatment or medication, there are no harmful side-effects of practising yoga in the right manner. 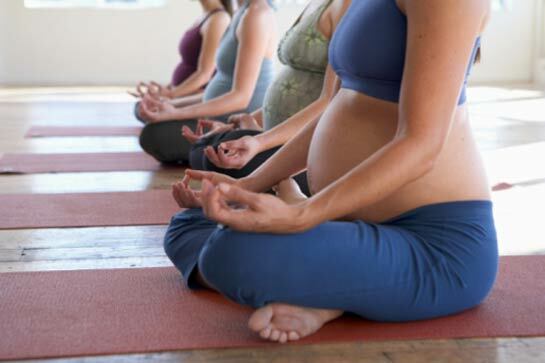 Yoga minimises the discomforts and complications faced during different stages of pregnancy. Yoga improves the circulation of blood, which really helps in dealing with different functional changes occurring in the body. Yoga stretches the body, and therefore makes it flexible to deal with the increasing weight. It also helps in maintaining the balance between body weight and body mass index. Yoga uses breathing exercise called pranayama to calm the body and the mind by proper functioning of endocrine system of the body. Yoga ensures a comfortable and easy delivery. With regular practice of yoga throughout the pregnancy, the body parts which play an active role during the process of delivery become flexible, toned and strong. Many woman who practice yoga regularly have found delivery to be much easier. Yoga stretches all ligaments throughout the pelvic, hip, and leg area, resulting in easier positioning and pushing during labor. In the birth process, breathing plays an important role and is an important part of a successful delivery. Regular practice of pranayama keeps the pregnant ladies more in-synch with their breath, which prepares them well for power-breathing in different stages of labor pains. Yoga plays an important role in getting you back in shape post-delivery both externally and internally. It massages the internal organs gently which have gone through a lot of stress in past nine months and re-tones them. Yoga helps in overcoming post-pregnancy discomforts and problems such as stretch marks, piles, excessive bleeding, loss of bladder control, insomnia etc. Yoga stretches and strengthens the body in all directions and areas. This help to get the whole body back in shape quickly after pregnancy and delivery.